With just a couple of key strokes on Toxicdocs.org, I was reading a February 1979 letter from Union Carbide to its employees. The firm was telling employees not to be alarmed about co-workers with brain tumors. I was sucked into Toxicdocs.org. I soon forgot I intended to write this blog post. Over the last 30 years, historians Gerald Markowitz and David Rosner had amassed an enormous collection of documents. Many were obtained by attorneys through the legal discovery process. Lawyers called up the historians—initially in litigation over childhood lead poisoning—for their expertise in answering the important questions: who knew? and when did they know it? In a commentary published in the current issue of the Journal of Public Health Policy, the historians describe teaming up with Merlin Chowkwanyun to address the document-overload problem. Chowkwanyun provided the expertise in using technology “to overcome historians’ previous limits.” But in classic public health style, the effort was not just for their own benefit. “We can expect great things from Toxicdocs. The new portal broadens access to crucial traces of corporate malevolence, and in this sense serves as a democratizing force. We will always have bad actors, but now, at least, there is a greater chance that someone will be watching. The six other commentaries—written by Senator Sheldon Whitehouse (here), the late Jock McCulloch (here), Elena N. Naumova (here), Stéphane Horel (here), and Christer Hogstedt and David Wegman (here)—are equally interesting. I first became familiar with the work of Gerald Markowitz and David Rosner in 1996 when I read about silicosis in their book Deadly Dust. They peaked my interest in cataloging industry records and using the collection to identify the tactics used by business interests to sow doubt about workplace hazards. Now with Toxicdocs.org, they’ve placed a smorgasbord of records at all of our fingertips. I’m eager to dig in. GREAT piece, Celeste! We are so very excited about all of this–and hope to hear lots of reports of users’ experiences–eventually what they are able to accomplish by way of protecting workers and communities and the environment. We are open to publishing more about work using ToxicDocs.org in the Journal of Public Health Policy. Wow! 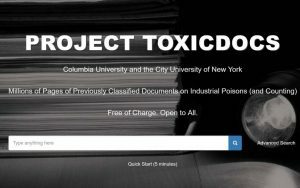 Toxicdocs are amazing website, open-secret docs are open to all. This is like a treasure. I hope this kind of information will not use for people who has hidden agenda. Many original documents are very easy to print and download. Let’s hope for the best. Great post Celeste.